Green party presidential candidate Jill Stein answers questions from members of the media on Oct. 6 in Oakland, Calif.
"We have assembled an internal team to direct the recount, we have been in close consultation with our county clerk partners, and have arranged for legal representation by the Wisconsin Department of Justice," said Wisconsin Elections Commission Director Mike Haas in a statement. "We plan to hold a teleconference meeting for county clerks next week and anticipate the recount will begin late in the week after the Stein campaign has paid the recount fee, which we are still calculating." Haas added that the process is very detail-oriented and he is concerned that some counties will be challenged to finish on time. In a recount, ballots must be examined to determine voter intent before being counted. 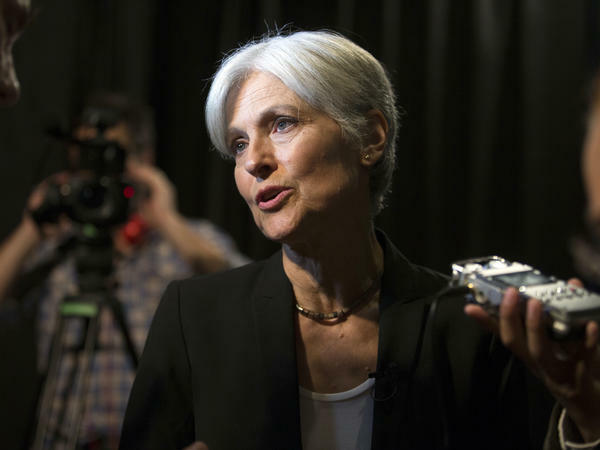 Stein has been leading the effort to force general election recounts in certain swing states. Her effort continues to gain steam — and money. On Wednesday she announced she would demand recounts in three states: Wisconsin, Pennsylvania and Michigan. President-elect Donald Trump narrowly won Pennsylvania and Wisconsin. As my colleague Domenico Montanaro reported, Michigan was still finalizing its results Friday, but will officially certify Trump the winner on Monday. To cover the cost of the recounts, Stein launched a fundraising campaign, which has raised more than $5 million in less than three days. Stein's fundraiser website explicitly says the campaign is not an effort to help Democratic presidential candidate Hillary Clinton, but to "ensure the integrity of our elections." Clinton has not commented on the efforts. The deadline to file for a recount in Pennsylvania is Monday and Michigan's is Wednesday. "State law allows any candidate on the ballot to request a recount, but if the margin is more than 0.25 percent, the candidate must pay for its cost. "Haas said the recount would cost at least $500,000. "The commission is reviewing state law to determine when that money would be due. "Once a recount order is issued by the commission, clerks across the state have 13 days to complete it, Haas said." Stein initially set a fundraising goal of $2.5 million. As donations started pouring in, that goal jumped to $4.5 million, as New York Magazine's Yashar Ali pointed out on Twitter. By Friday, the goal had jumped again, to $7 million. The campaign says that will go to cover filing fees, attorney fees and other associated costs. Donations are still rolling in, but as Stein's fundraising website states, money doesn't necessarily mean the recounts are assured: "We cannot guarantee a recount will happen in any of these states we are targeting. We can only pledge we will demand recounts in those states." If the recounts don't happen, what will become of all that money? Stein's website says any "surplus will also go toward election integrity efforts and to promote voting system reform." It did not specify what those efforts would be. As NPR's Camila Domonoske told the Newscast unit, "Some security and election experts have publicly called for paper ballots to be checked in Wisconsin, Florida and Michigan, to make sure that the computers that counted those ballots weren't hacked." But, she says, "There's no evidence that the electronic machines were hacked or the election was compromised." This post was updated Saturday Nov. 25, 2016 at 10:30 a.m. to include new reporting that Trump will be certified the winner in Michigan. UPDATE: Green Party presidential candidate Jill Stein has filed a request for a recount of votes in Wisconsin's presidential election. Republican Donald Trump won Wisconsin over Democrat Hillary Clinton by about 22,000 votes. Stein got about 30,000 votes. Stein made the request late Friday afternoon and must pay for the costs associated with the recount. Although the presidential election is behind us, there’s still one more essential procedural step. Members of the Electoral College will meet in December to officially install Donald Trump as the nation’s 45th President. The process has come under fire this year, because Hillary Clinton received the popular vote while Donald Trump picked up the electoral votes needed to win. And, there’s been some talk of electors casting protest votes.